The following projects relate to capturing movement within a photograph. In the first exercise we are asked to take several pictures of a moving object taken at varying shutter speeds. I used a local 'A Road' and captured some of the cars as they passed. 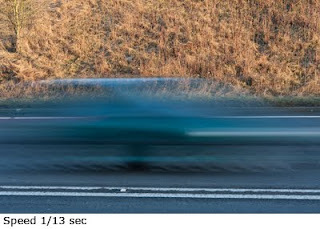 The first image taken at 1/13 of a second shows a blur that is not instantly recognisable as a car at all, but does show extreme speed. 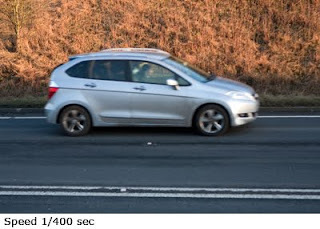 The next image was captured at 1/60 second and shows a car clearly moving at some speed with the whole of the car blurred through motion. I personally am not keen on this type of image. 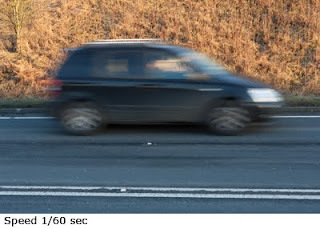 At a speed of 1/400 second the car is almost frozen, the body blurred a little with the wheels clearly blurred; it is most likely the wheels are moving slightly faster than the car body. 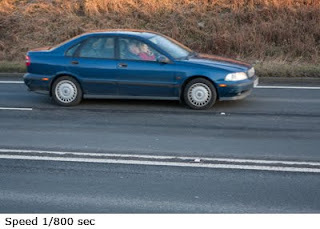 This is my favourite image as this shows a car clearly but with elements of motion. The final image was taken at 1/800 of a second, which given the fading light was about the highest I could go to at a reasonable ISO of 640. This image has frozen both the car and wheels with the holes in the car's hub caps clearly in focus. This image lacks all sense of motion, it could well be parked!